Preheat oven to 350°F. Cover a baking sheet with a piece of aluminum foil. 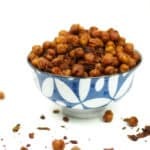 In a medium bowl, combine chickpeas, olive oil, hot sauce, chili powder, paprika and sea salt. Toss to coat all chickpeas. Pour into a single layer on the foil-covered baking sheet. Bake for 20 minutes. Toss. Bake for 20 minutes. Toss. Bake for 10 minutes, then stir in bacon crumbles. Bake for 10 minutes. Chickpeas should be sizzling. Remove from oven and let cool completely before eating. Store in an airtight container.